Wow, when was the last time you saw this logo? 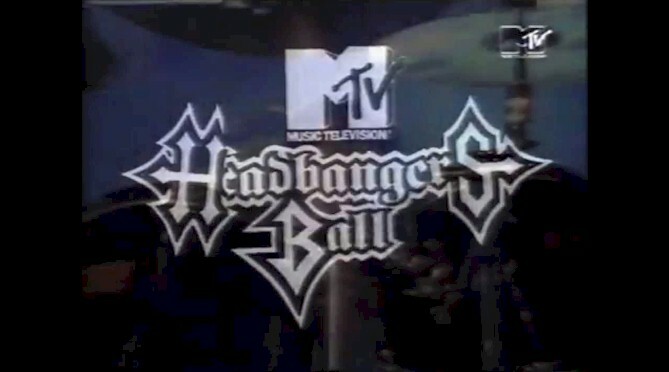 MTV's "Headbangers Ball" aired its first episode on April 18, 1987. Since then the show has existed in some variation via networks or online programming. Its prime time was the 1987 through 1995 period when it routinely aired around midnight every Saturday night. The show's original hosts were Kevin Seal and Adam Curry before Riki Rachtman took over and added a popular personalized touch. Ultimately the show came to an end due to the rising commercial success of alternative and grunge rock. "Headbanger's Ball" was replaced by the subpar show Superrock, hosted by Julia Valet. So, it is now with great shock and elation that we see a tour poster released showing the original "Headbanger's Ball" logo. This European tour is being offered by Continental Concerts in cooperation with MTV. The concept is to make this tour continue a series of events that not only showcases some of the best heavy metal bands, but also celebrates its diversity. The first tour features bands culled from metalcore, death, folk and power genres representing the US, Finland and Canada.